Have you decided what e-commerce solution to choose for your online store? Today, we decided to make this decision easier for you and present to you the pros and cons of using two of the most popular e-commerce solutions: Bigcommerce vs. Woocommerce. We will compare the popular SaaS (software as a service) e-commerce platform – Bigcommerce – with the giant Woocommerce for self-hosted online shops. We’ll guide you through their best features, pricing and website maintenance costs, customization and design, and more. We’ll also give you some roundups with some of the best Bigcommerce themes, WordPress themes for online shops and WooCommerce add-ons for your site. At the end of this detailed comparison guide, you will be able to make an informed decision and choose the best e-commerce solution for your online business. Analyze the comparison below and weight the pros and cons of each e-commerce platform. Bigcommerce is an e-commerce platform that gives you a complete package with all the tools you need to easily launch your online store in a matter of minutes or hours and start selling your physical or digital products online. This service is available for a monthly or yearly fee and you don’t need to hire a web designer to set up the site for you. Managing your e-commerce business can be done from a single dashboard. This platform lets you customize your site, manage shipping, orders and payments, and even list your products on Amazon, eBay, and Facebook, but we’ll discuss this in more depth below. WooCommerce is an open-source eCommerce plugin you can download for free. It was built for WordPress and works only on WordPress-powered websites. 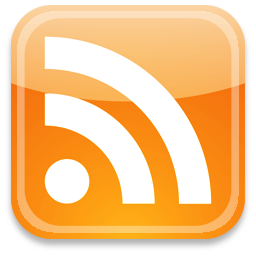 WordPress is a free content management system for your site and can be installed in just a few minutes. 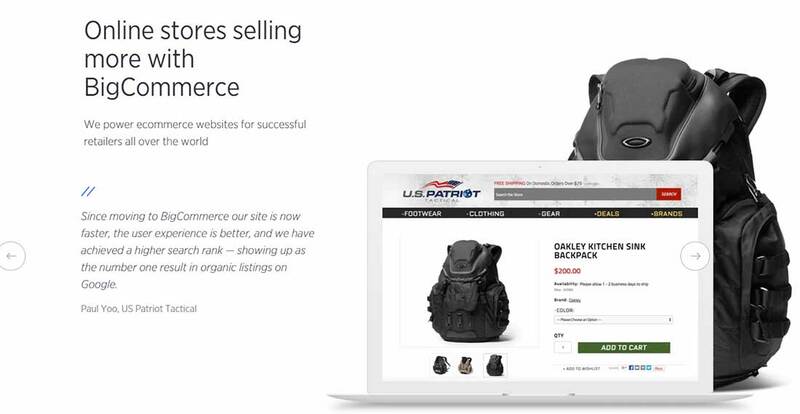 This extremely popular plugin was launched in 2011 and it’s by far the most customizable eCommerce platform for building your online shop. Bigcommerce offers 4 pricing plans with no transaction fees, unlimited products and unlimited file storage and bandwidth, and staff accounts. different sales channels (branded online store, eBay and Amazon, a point of sale, Facebook/Instagram, Pinterest, Google Shopping. This plan covers up to $50k online sales per year. This plan covers up to %150k sales per year. This plan covers up to $400k sales per year. 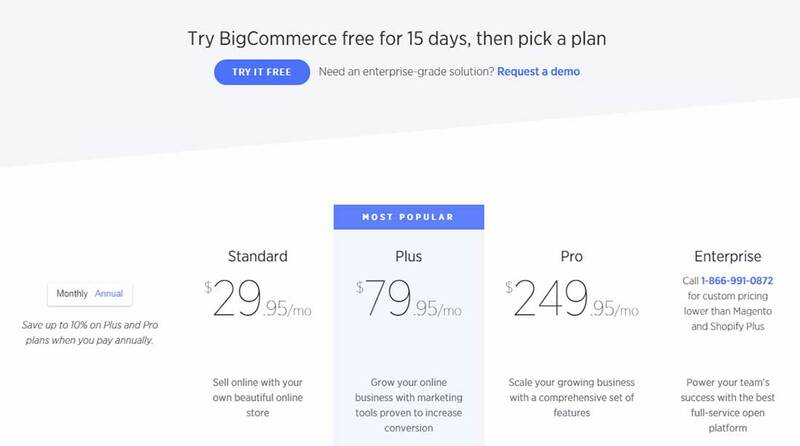 Bigcommerce offers a free trial period of 15 days with no credit card required so you can test it out for 15 days and get used to how the platform works. Bigcommerce has no transaction fees on all plans, though you’ll be charged credit card payment fees which vary depending on what processor you use and your country of origin. Unlike other e-commerce platforms, Bigcommerce’s fees are reduced as you grow, depending on the plan you choose. You can go down to 2.2% + $0.30 per transaction for the Enterprise plan. WooCommerce is a free plugin for WordPress, which is also free to install on your website. No monthly fees or transaction fees will apply. However, the overall costs of running a WordPress site are not 0. For starters, you will need to purchase a domain and a hosting plan with a hosting company of your choice. Then, you will have to pay for an SSL certificate. As an estimate, a domain may cost you somewhere around $15 and you will pay for it yearly, web hosting can be paid monthly or yearly and it’s around $8 per month, but it will increase as you grow, and an SSL certificate is around $70. The initial costs may be higher, but it can be a better solution in the long run, once your site grows in size. If you’re planning on having a large online store, WooCommerce may be a more cost-efficient solution for you than Bigcommerce. We’ve talked about pricing, now what about store management? This is where Bigcommerce will win the round, as it offers a 360-approach to online commerce, taking care of everything for you and making it easy to manage your online shop. WooCommerce can be easy too, but you’ll need more time to learn how to do it. Also, you may need to add a bunch of extensions to add the extra- features you may need. Bigcommerce can be managed from an intuitive interface and the templates can be easily customized with no coding knowledge required. You can manage your products, sales and inventory with ease. The only con this solution may have in terms of store management is that it’s more limited than WooCommerce. With WooCommerce you can do everything Bigcommerce lets you do, and more! But in order to enhance it, you’ll most likely need a web developer to help you through the process. Also, Bigcommerce comes with support, so you’ll always have someone ready to answer you all the questions you may have. With a Woocommerce site, you’ll have to be your own support, either by studying how to fix the bugs yourself or hire a specialist. WooCommerce is very flexible – the sky is the limit when it comes to the upgrade possibilities. Because it’s such a popular CMS, you can choose from over 50.000 free plugins to add even more functionalities to your store, with ease. If you don’t want the hassle of managing everything yourself, Bigcommerce may be the best solution for you and the pricing and other fees may be worth it. The payments set up process is quite easy in both of these cases. Bigcommerce lets you choose from their payment gateway integrations to accept payments online and it’s even letting you accept offline payments, such as check, bank deposit, or cash on delivery. There is no limit to how many payment methods you can set up. Square ( for United States, Canada, United Kingdom, Australia), Stripe (available in Australia, Austria, Belgium, Brazil, Canada, Denmark, Finland, France, Germany, Hong Kong, Ireland, Italy, Japan, Luxembourg, Mexico, the Netherlands, New Zealand, Norway, Singapore, Spain, Sweden, United Kingdom, United States) and Worldpay (Worldpay Core and Worldpay Ecomm) – just for US. WooCommerce has PayPal and Stripe as default payment processors, but it can be easily integrated with all the other major payment providers using add-ons. We added a link to a payment processing providers plugins list below, so make sure you check it out. Credit card processing fees will apply depending on the provider you choose, just like for Bigcommerce. 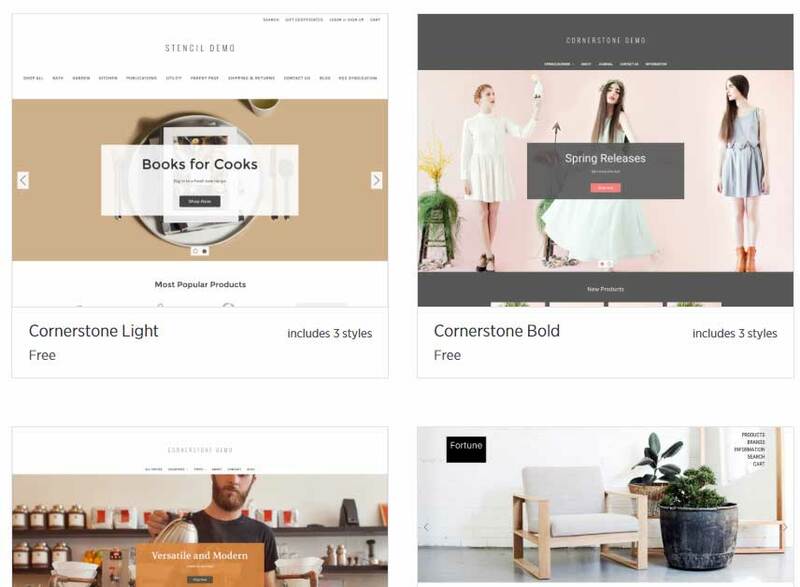 Bigcommerce offers 7 free themes but the designs are very similar, as they are actually variations of just 2 base themes. However, there are plenty of premium Bigcommerce themes to choose from, as the gallery includes over 100 themes (variations included). The prices range from $145 to $235 for a template. You can easily customize Bigcommerce themes via an easy to use, intuitive editor, so you don’t need to hire a web designer to do it for you. All the colors, fonts, images, texts, can be modified from just one place with ease. WooCommerce wins this round by far, as it gives you access to a huge number of both free and premium WordPress themes to choose from. 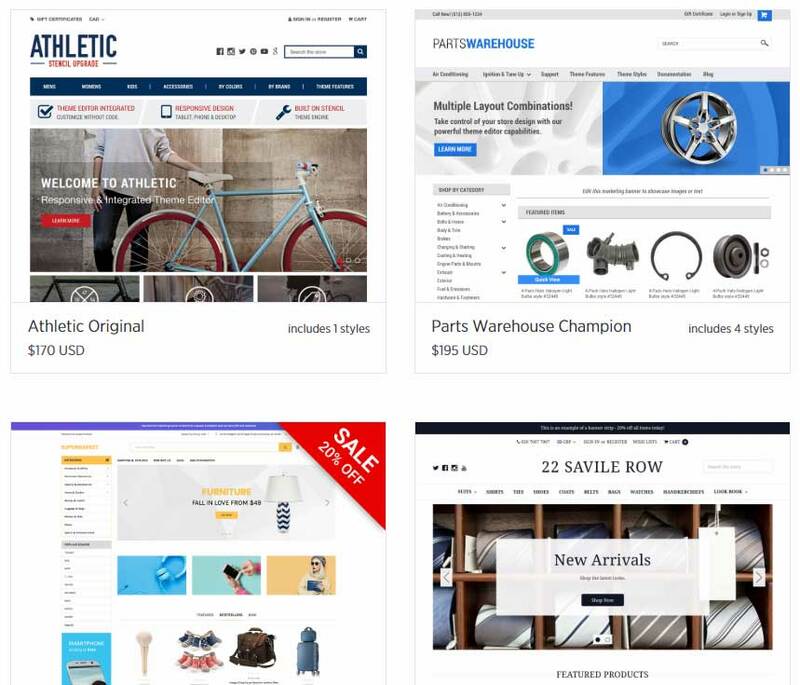 With the help of page builders and theme options, you can easily customize the WooCommerce friendly themes you find even without the help of a web designer. However, if you want to make more complex changes, you may need to hire a web developer. Most of the page builders premium WordPress themes come integrated with have drag and drop interfaces, so it’s very easy to make any changes to your site or add new pages. A WordPress theme for WooCommerce can be free, or you can pay 50-150$ for a premium one. Most premium WordPress themes cost somewhere around $55. Check out the roundup links above to see some of our top picks for WooCommerce-friendly WordPress themes for selling both digital and physical products. Both Bigcommerce and WooCommerce gives you the possibility to extend their functionalities via add-ons or apps. You can add marketing, sales, accounting, shipping apps and more! You will surely find an app for what you need. Bigcommerce gives you access to only 600+ add-ons, but they are more than enough. Here are some of the main app categories in the Bigcommerce App Store. Shipping apps: ShipperHQ, Ordoro, Endicia, ShipStation and ShippingEasy. ERP integrations: NetSuite, Brightpearl and Microsoft Dynamics. Accounting apps: QuickBooks, Xero and Sage. CRM apps: Salesforce, NetSuite and Zoho. Marketing & conversion apps: HubSpot, Google AdWords, A/B testing tools, and more. Powerful API: For building custom integrations. WooCommerce is one of the most popular e-commerce solutions on the web, thus giving you access to over 50,000 free WordPress plugins and many more paid plugins. There are WooCommerce add-on plugins for absolutely anything you can think of, from payment gateways, lead generation, optimization, to SEO and more. Both Bigcommerce and WooCommerce can be adjusted and scaled up as your business grows. There are pros and cons for each one of these solutions. Bigcommerce offers an optimized process for scaling up your site, without you worrying about any issues that may appear, such as performance problems. You simply upgrade your plan and the resources and provided to you. With Woocommerce, on the other hand, things may be a bit more complicated. Yes, it may be cheaper, but all the updates backups and security audits must be done by you or by your team. Hosting costs may increase. In conclusion, with WooCommerce you’re more in control, but is it what you need? if you don’t have time to be in charge of all the little, but important, things and don’t have money to hire a specialist, Bigcommerce may be the better solution. We hope this Bigcommerce vs. Woocommerce detailed comparison guide will help you decide what is the best e-commerce solution for your site – a self-hosted WordPress site powered by WooCommerce or an all-in-one platform like Bigcommerce.